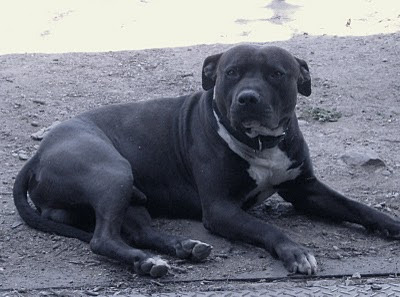 Sometime on Friday the 18th December 2009, our Staffordshire Terrier was bitten several times in the head / neck area by a tiger snake. We didn’t know he had been bitten, as he showed no signs of distress as we enclosed him in his kennel, - along with two 8 month old Shi-Tzsu puppies on Friday night around 11pm. It was only on Saturday, 19th December, around 6am that we noticed and suspected that he had been bitten. His pupils were large and clouded, he showed signs of agitation, he staggered when he walked, he seemed generally disorientated and reacted slowly. We found the mangled tiger snake near the colourbond gate later in the afternoon. We felt it important to move him indoors, keep him quiet and peaceful, cool, well-hydrated and with as few stressors as possible. It was handy to have lots of newspaper, blankets and old towels on hand. Later, we bought disposable toddler nappies (for up to 30kg), which made life much easier. Several times per day, we would change the bedding and newspaper. A temporary bed was made with a thick blanket doubled over and used as a mattress, which was inserted into a couple of large black dustbin bags. On top of the waterproof bin bags, we placed a large dry towel. We would also bathe the dog with warm water and Dettol, drying him gently and thoroughly. When the temperature reached almost 40 degrees, we sponged him down and placed a fan near him for a short period of time, until he had stopped panting. We moved him regularly, from side to side during the day, to avoid cramping. We only started to feed Bobby on the third day of his recovery, as he couldn’t lift his head and could hardly swallow. When we did begin feeding him, it was with runny food in small amounts during the day, - firstly via a syringe and later, by spoon, very carefully and slowly to avoid choking. Each time we fed him, we had to hold his head, to allow him to swallow. Each time we handled Bobby, we wore rubber gloves and sterilised all utensils. Below is a summary of how we treated our Bobby with Vitamin C and strong black coffee, along with thoughts and observations on his daily recovery. At the time of writing (12th January 2010) Bobby has recovered completely from his ordeal. He has lost weight, and the bone in his ‘buff-head’ is protruding a little, but his appetite is as healthy as ever. Able to move only slightly. Paralysed by late afternoon, although his tail wagged a little late at night. Lay on stomach in ‘frog’ fashion. Mainly paralysed. Minimal eye movement. Pupils smaller. Minimal tail wagging. Brown urine. Incontinent. Swallowing water much better. The noise of the syringe encourages him to move his tongue, ready to receive. Good appetite, but only small amount of food administered by tablespoon (about 1/2C each time). Tail wagging. Eyes have lost that blank stare. Vigorous kicking of back legs when turned over to new position. Good appetite. Stonger tail wagging. Eyes have lost that blank stare. Tongue movement increased. Able to swallow chunkier food. Actually seeking food that had spilled out. Hot and panting. Cooled with damp cloth over body. Worked his way off the bed onto the cool tiles. Moved Bobby into the lounge for Christmas. Peeing a lot, change of urine colour from reddish brown to normal. Able to eat alone for most of his meals. Prefers to lie on belly, commando crawling. Able to eat himself. Crawling on belly more and more. Getting stronger holding his head up for food. Able to roll off his side onto his belly. Having difficulty getting his paws from under his forearms. Had to put two nappies and a pair of old tights, cutting hole for tail. No poos for three days now, previously runny stomach. Much more responsive and wags tail at the sight of us, without even speaking. First day outside. Staggering on his feet, wanting to pee himself. Staggers, falls, gets up and walks, then staggers. Lifting his head. Drinking water by himself. Eating by himself from a dish. Quite content to be outside, even though heavy rain. Slept in the laundry. Spent the day and night in the kennel. Able to walk for longer distances. Prefers to go down the garden to ‘toilet’ area. Spent day in kennel, although very receptive to fuss, returning straight to kennel (for recuperation?). Eyes still a little weepy, but a lot better. Right eye is worse. Drinks lots of water from bowl. Comes out of the kennel when called. Good appetite. Very mobile. Barking and playing with other dogs. Still a little wobbly on legs and becomes tired and has to lie down for a while to re-charge. Right eye still weeping, but is able to open it fully. Fully recovered. Needs to gain a little more weight. Still receiving 10ml Vitamin C by injection, as well as weekly 1.5m Vitamin B. We will administer this for another week, making it one month since being bitten. Wow. What devotion to your Bobby. He is one lucky dog. TMW, this is very good, as you know in the UK we only have adders, have been bitten twice and am immune just like a big wasp sting. Vitamin C never knew that. I eat D+ Marmite seems to do the trick. Can't imagine walking about and being bit by anything that nasty. Give him a hug from us and tell him he's a lucky dog. Congratulations! Thank goodness he pulled through, and by natural means as well, plus the love he must have felt coming from you all during his time of recovery. That, I would think, must have been the strongest factor: the love. When I saw his picture I smiled and pet him with my cursor. Good dog. Bless his heart and yours too. Your love and devotion have brought him to where he is today. I love the look in his eyes. He is looking into your soul. Very well done you.at least he's now probably snake proof. So glad to hear the dog has recovered so well,but what a worry you must have had.We do not have snakes in Ireland,St Patrick banished them !!! One of our dogs was poisoned by rat poison a few years ago,I remember only too well how worried and concerned we were at the time,thankfully our dog made a full recovery thanks to our vet. The only snakes we have are in the House of Commons and they regularly attack us. I'm pretty certain that it wouldn't be vitamin 'C' I'd be administering to them. Bobby is one lucky fella to have such loving owners and I really mean loving. You are life savers. If he was able to Bobby would certainly put you forward for a paws award. Poor Bobby. What do human's do if they are bit. I'd love to visit Australia- but don't fly and terrified of snakes. Having received round the clock care from loving and devoted humans, I know that Bobby will return this to you a thousand times over. I'm so pleased he's well again. Helen -- Thank you so much for your wonderful posts; you are a very sweet person, hope you know that! Thankyou all so much for your encouraging comments on our Bobby's recovery! I read them all to the Machinist, and he was very moved. Not a man of many words, but choked up, nonetheless. Vera, I do believe you are right about the love we showed him during his recovery. He couldn't even move, but we could see by his eyes that he could hear us and was comforted by our presence. I would choke up when I watched the Machinist stroke him and tell him that he needed to get better! Flowerlady, this is such a precious comment. As I read it, I automatically started petting Bobby's photo with the curser, too. Bless you! And thank you. Matron - not only is Ireland beautiful, but there goes another reason I could easily move over there. Snake free! Yay! I also recently learned that New Zealand doesn't have snakes, either. Oh, it's tempting. The Machinist has two worries about snakes; one is contending with the devastation of a pet being bitten. The other is calming me down and talking me out of wanting to move to the concrete jungle..
Ken - I agree about the reptiles in the House of Commons. Too funny. Also, I would gladly and proudly receive the paws award. The Machinist deserves it more, though. Watercats - it is most interesting to watch nature take it's course. I believe our bodies are self healing if we give them the chance. It is so scary, though, watching a pet in such a state and not knowing the outcome. There were times I pleaded with the Machinist to take him to the vet, but the vet assured us there was nothing he could do that we weren't already doing. Thoughts like 'are we prolonging agony' were constantly going through our minds..
Linda - I've never known anyone who has been bitten. I saw a movie called "Jessica" by Bryce Courtney and someone was bitten in that movie. Death was inevitable back then. Nowadays, they have antivenom. You have to know the type of snake before they administer it. Some hospitals have a general antivenom, but not all. This worries me greatly, as snakes are all over the place. Double yuk. Some say that you bandage the limb and get to the hospital within 20 minutes. Others have lasted longer before antivenom. I would always recommend a super large dose of Vitamin C in the meantime, though..
Angelcel - you're right. Bobby is returning The Love. He is so sooky now. He wants to sit next to us all the time. He 'noses' the door to get in and whimpers. If we get up to walk into another room, he follows us. All new behaviour. Massi - thanks for your well-wishes. And I really enjoyed my visit to your blog! Michael - such a sweet comment, coming from a sweet man himself. There's something about owning a dog, isn't there? It completes your life and family. Each time one of ours passes away, we say 'no more'. Hmmm... I don't think we've lasted a month. I can't remember not having a dog. Actually, I can't remember not having a pack. Good job the Machinist is tolerant of my 'bring 'em home' ways! FF - Although Bobby is an 'outside' dog, you wouldn't really know it. He's more inside nowadays. He's very clean and waits at the door for wanting to go and pee. If we don't see him, he will come and fetch us. I worry about our other dogs, too, as I don't know what they would do if they saw a snake. Some dogs rear away. Some, like Bobby, are territorial and will go for the snake. Very scary stuff. FF, I have NEVER gotten used to the creepies, insects and heat. I battle with them constantly, so I hear you..
What a wonderful story of love and devotion! So glad your pet is on his way to a full recovery! He must love you so much! I'm so glad your pup survived! Thank you for taking such great care of him, & you should be commended for using Vit C (I assume you injected it? ).It's OBVIOUS Bobby was envenomated by his symptoms, & the 'C' was most likely what saved him...I'm so sick & tired of people calling this an "old wives tale", or B.S. It works, everyone should know. They should also know it works on humans per the work of Dr Frederick Klenner MD. Thnx for sharing your story!